Ahhhh, vintage luggage. How I love ya. Nowadays suitcase are all about being practical (and about 90% of ’em are black). 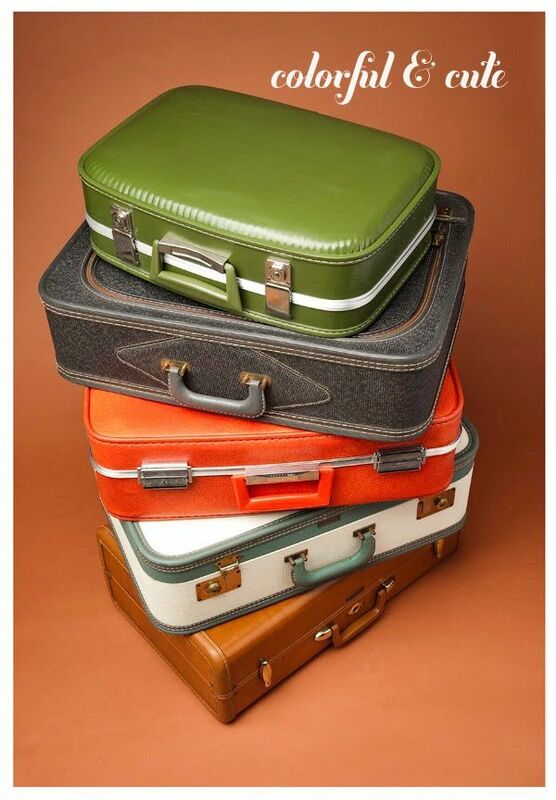 But back in the day, suitcases were colorful and stylish. Your luggage was almost like a fashionable accessory—and helped to make the whole travel experience a more stylish event. 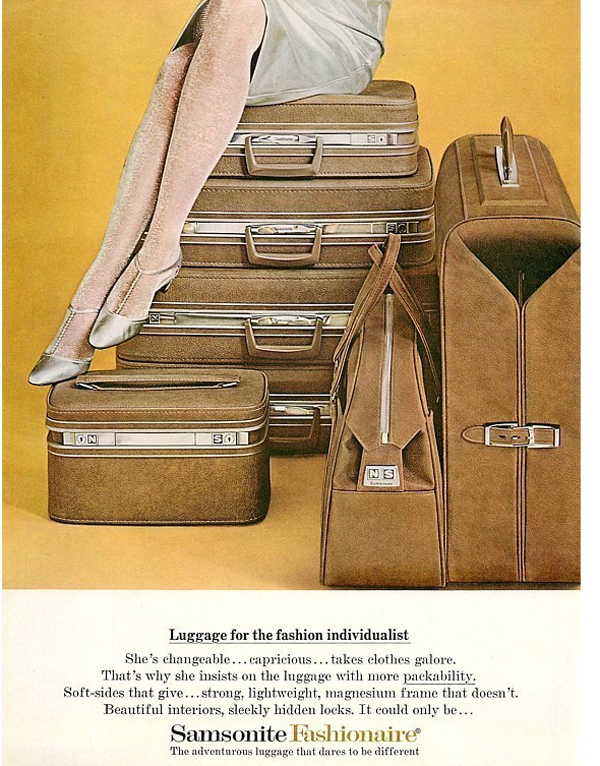 There are so many excellent vintage suitcases out there but one of my all time favorite vintage luggage lines was the Samsonite Fashionaire of the 1960s. The Fashionaire (see? already the name is more stylish!) came in a variety of hardshell cases (including an adorable makeup case/train trunk) and was produced in bold colors like hot pink, electric blue and cherry red. 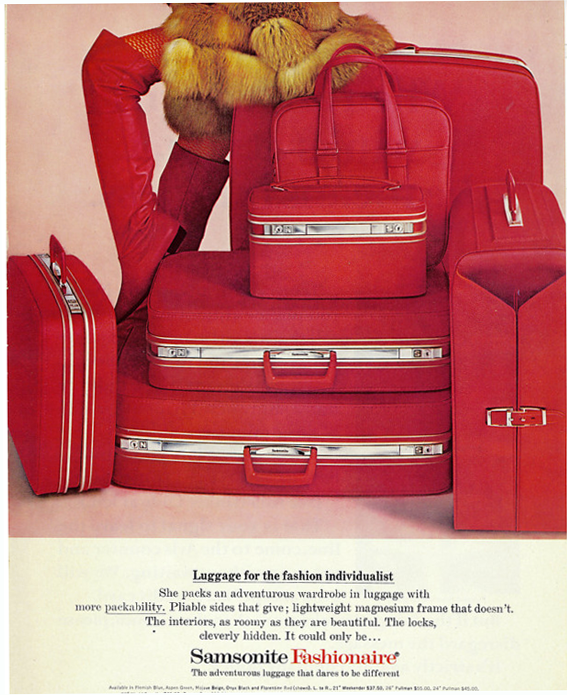 With a tagline, “Luggage for the fashion individualist” the Fashionaire was marketed to women as an extension of the stylish woman’s wardrobe. 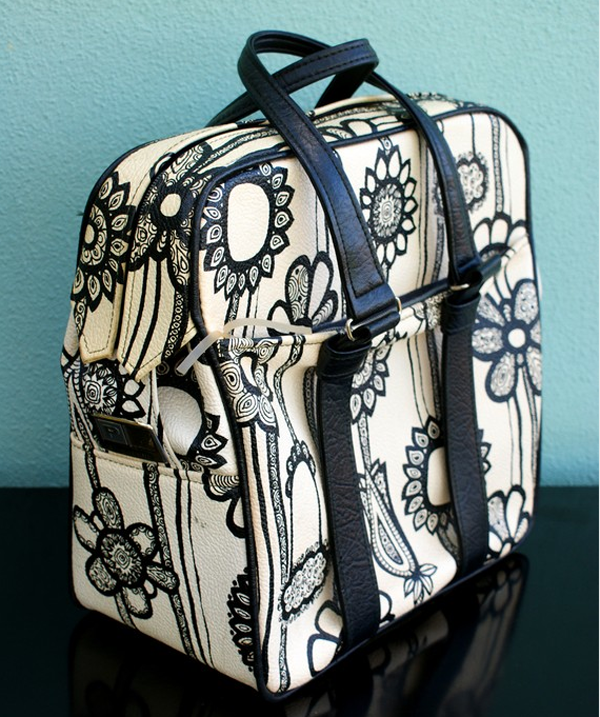 But of all the Fashionaire colors, my tippy top favorite is the kicky Black and White pop floral. The distinctive pattern is so unique and contrasts amazingly well with the bold orange lining. Loooooooovely, no? This version tends to be the “go-to” vintage suitcase for stylists all over the world. If you keep your eyes open you’ll see it frequently used in commercials, music videos and fashion spreads. 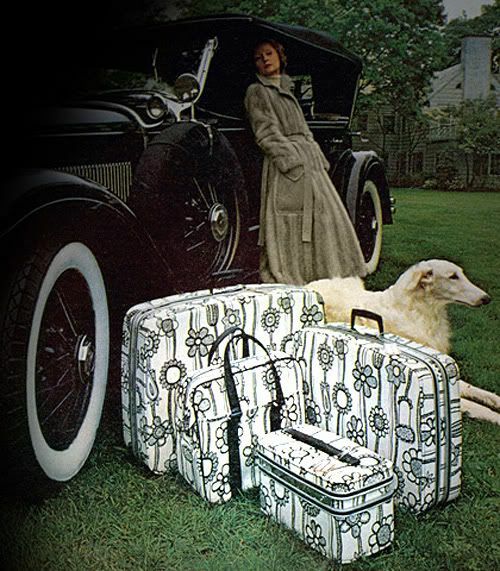 Although none are quite so glamorous as the original ad…..didn’t every stylish woman own a Model-T and an Afgan dog?? Contrary to popular belief, this is NOT a Markimekko pattern! You’ll often see it listed as such on ebay or Etsy, but this is not true. I suspect some enterprising eBayer added it to a listing in hopes of drumming up interest ages ago—and thus a vintage rumor was spawned. 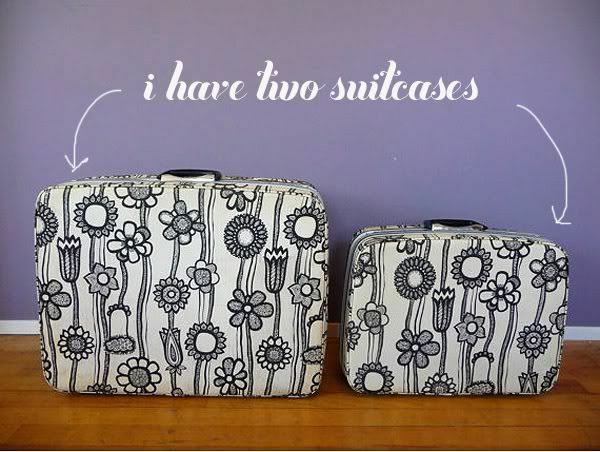 It was, in reality, simply a pattern created by the Samsonite design team. I have four different pieces from this line and they just make me so darn happy. And I also have the travel tote bag, which is by far the most practical and one of my favorites. No, your eyes are not playing tricks on you! 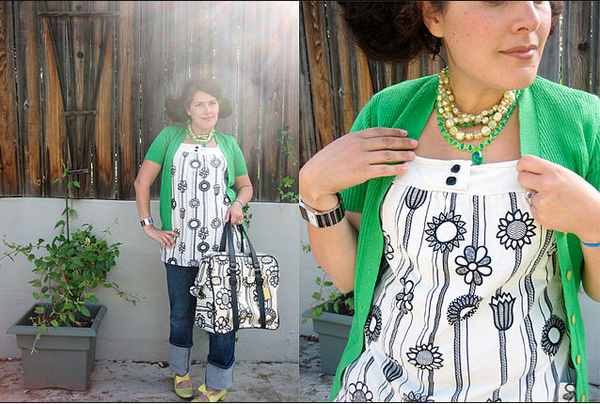 A few years ago I found this awesome little tunic from Delias that had the exact same pattern on it. I guess one of their designers was “inspired” by the luggage. I think it’s pretty fun! 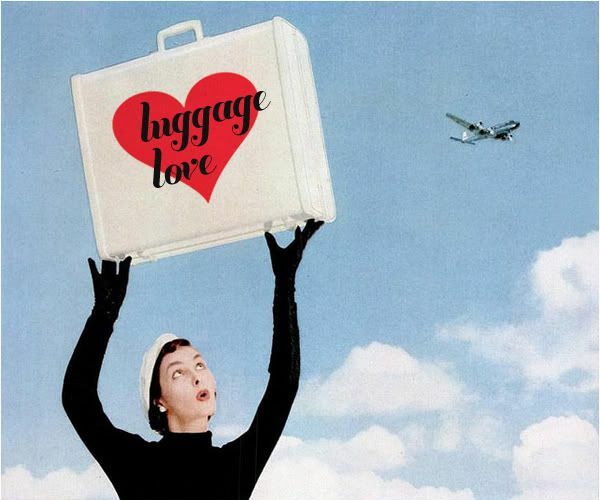 So as much as I love my vintage luggage, I have to be honest—I don’t love schlepping it around town. If you own any vintage suitcases then you know the ugly truth. They weigh a freakin’ ton and are utter back breakers—not very practical. I learned the hardway on a trip to Vegas with the Devil-Ettes. I saucily sported my pink hardshell Samsonite suitcase. And while I got plenty of compliments on it, dragging that thing from the airport to my hotel was not a pretty picture—sweaty sequins do not a glamor girl make, my friends! I think it weighs 10 pounds EMPTY. So I rarely use it, unless i’m going on a road trip. 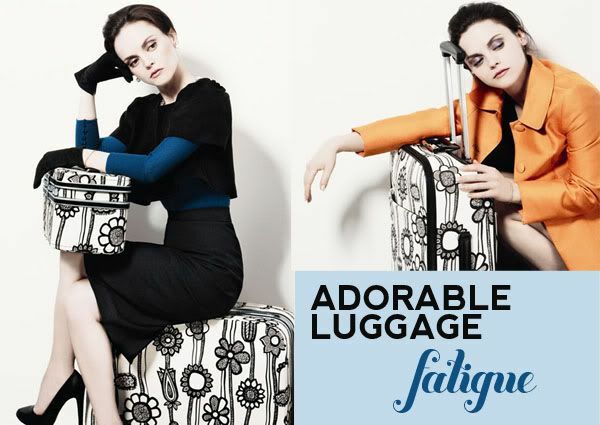 A few years ago Samsonite re-released the Fashionaire line as part of their Black Label Collection. 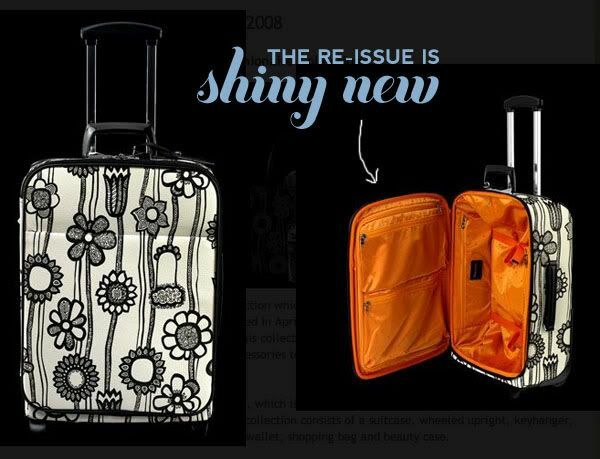 They only created a limited number of the hardshell suitcases, traincase and flight bag…..but what was interesting was that they “re-imagined” the bag as a roller suitcase! It’s a little weird looking but I found it pretty cute. Christina Ricci was the spokes model for the launch and I saw photos of her rolling it around. In addition to the iconic “Black on White” pattern, they came up with a snazzy “Black on White” version (which looks much like an x-ray of the original). The suitcases cost a pretty penny but are mostly sold out. You can still find the black roller cases online. They are made of a newer shiny “hardshell” material. If you’re intrigued by the vintage Fashionaire (and you know you are!) you can often find them on eBay and on Etsy. And if you’re reeeally lucky, you might even spy this uber rare raincoat—which the vintage shop on the way to my work had in its window earlier this year. Ahhh, if only. Posted in Best of Alix, Vintage Pop Culture. Tagged with samsonite, vintage luggage. yeppers cutie…I think you scrolled down too quickly because the paragraph with the Christina Ricco pictures is all about the new luggage they released! It’s in black and white….and I also saw a version in purple and white (which i didn’t like as much, it was an odd purple). As soon as I replied, I noticed your section on the new line… *blush*. I should have known you’d be up on it, girlie! You are so cute! Well i’m glad you commented because it made me think, “hmm, maybe i wasn’t clear?” so I added in another photo! hee. you are just an awesome commenter and i can see you being all excited, like “Ooh! I’ve SEEN THAT! !” I’m now dying to know if its still at Kohls or TJ Maxx or something! I would love to see it in person!! 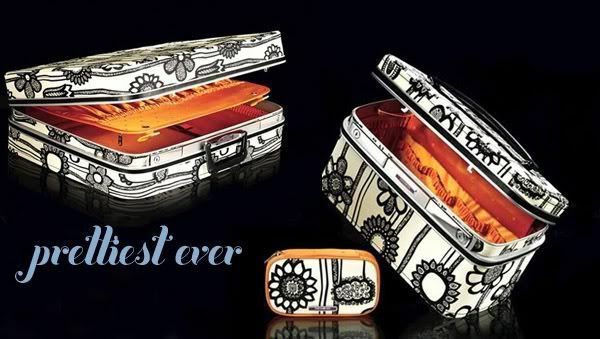 So I had a vintage Samsonite suitcase and train case in orange that looked similar to a fashionaire but I remember the name of the line being different and the interior was an Asian-type floral pattern. Sherbrooke, I think. Anyway, in addition to them being horrible to schlep, I never could quite get the musty smell out of them. 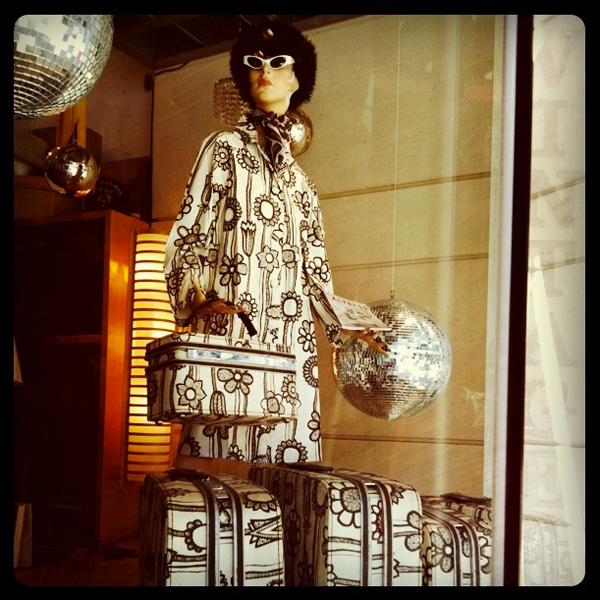 :o( Anyway, that KIND OF ended my love affair with vintage luggage. But nowadays if I am going on a weekend trip I just pack my big 80s Le Bag tote bag anyway! I would kill for that floral carryall, though!!!! Also, while I was looking for my old suitcase on etsy I found this TOTALLY SWANK ladies briefcase. Drool! oooh i’ve never heard of “Sherbrooke”! How cool! (I love discovering new vintage stuff. The heck with Christina Ricci! You should be modeling for Samsonite Miss Alix!! Love your matching tunic. Beyond hip and coolio. Hi alix! You wouldn’t happen to know how/ where I could get the white/ black floral raincoat? Alas it is a highly coveted item. I HAVE seen it come up on ebay though! Search for Samsonite Raincoat (and even Samsonite Markimekko Raincoat…it’s NOT marimekko but people often mislable it!). Good luck!! Do you have any idea what a replacement value would be? Thanks for your help if you have any idea. oh man!!!! What a bummer!!! I think they are worth quite a bit, as they don’t make them anymore. I see the hardshell black with white version reselling for $300+. You can get a purple with white flowers for around $140. Good luck, i’m so sorry! p.s.. i’m a purple freak so i’d even be interested in that one. Hello. 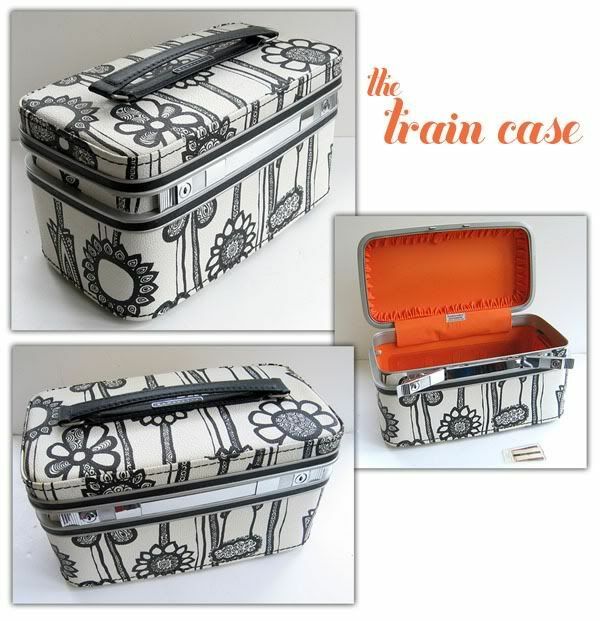 I have a vintage Samsonite Fashionaire train case that looks exactly like the Marimekko black and white, only it is full colors, in bold pinks, yellows, blues, greens, etc. I have searched the internet and haven’t come across such a case. It has the orange inside, and the Samsonite Fashionaire tag inside. I could send a photo. I can’t tell if someone painted it, or if this is just a rare piece??? It’s far too perfectly painted for me to believe someone painted it themselves. Any info?